You are here: Home / Blog / SEO / Soft 404 Errors – Does It Hurt Your Website Ranking? Soft 404 Errors – Does It Hurt Your Website Ranking? How do people come across to soft 404s? If you are familiar with the Google Webmaster Tools, you probably have come across to the “Soft 404” errors that you can find under Crawl >Crawl Errors >Soft 404. The quick answer for both questions would be “Yes” and “Yes”. A soft 404 happens when a user requests a page that no longer exists and is landed to a page that is different from the original page and yet the page still returns a 200 OK status server response. In case you are not familiar with the status codes, following are the most common ones when it comes to SEO. So a proper 404 should show the page stating “You did not find the content and this is a 404 page” with the status code 404. 2) Simply your 404 error page is configured incorrectly and is returning a “200 OK” instead of a “400 error”. 3) Content blocking system implemented by your hosting company or ISP that on the page is displaying a “404 error” but the server status is returning a “200 OK”. So how are soft 404s different from 301 redirects? The main difference lies in how the original source is signaling to search engines. In the case of a normal 301 redirect, the original page still exists and is telling search engines that the page is being redirected to a new page. In the case of a soft 404 redirect, the original page does not exist any more, so search engines are very confused when they landed to a page that is different from the original. Can soft 404s hurt my search engine ranking? Is it bad from SEO perspective? 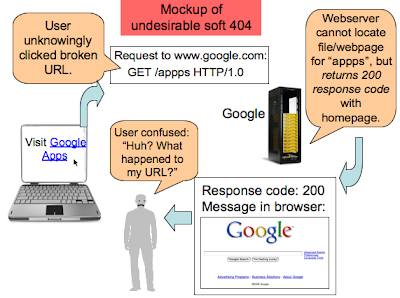 Google does not like soft 404s because they are not user friendly. Further more it can hinder Google bots from crawling your site effectively and wasting time on trying to index non-existing pages. Having said that, it is impossible to not have any soft 404s if you are running an e-commerce site with thousands of seasonal products as explained in one of the examples above. From SEO perspective, if there are substantial number of back links to a page, a 301 redirect should be implemented to capture those link juice. However, this should be done in a manner that the destination content should be relevant to the original source. Google has filed a patent and clearly states that is what their search engine will look for. From UX (User experience) perspective, if you have an existing page that is not only similar topic to the deleted page but also can provide value to your user, that would be the best page to redirect to. If not, create a 404 (with a proper 404 status code off-course) and provide a clear message that what the user is looking for does not exist, and some relevant links / search box to retain user on your site. How to solve soft 404 issues? To summarize, there are three logical ways to resolve this issue. 1) Determine if it’s worth your time to redirect the page or just serve a 404 page? Check Page Authority / number of backlinks to see if the page in question is worth your time to apply a 301 redirect. If not, serve a 404 page for that specific URL instead of status code 200. This is probably the best choice but is likely the most expensive choice for a business to implement. As mentioned above, a soft 404 happens because search engine thinks the destination page is not relevant to the original, so why not just create a new page to serve that purpose? This approach is recommended for businesses with limited resources and unable to implement 301 redirect (for whatever reason). From SEO perspective, this would be the best way to keep Google and other search engines happy if you do not have relevant content to redirect to. From UX perspective, this makes sense if there is no page that can substitute the deleted page. There are various reasons that could cause soft 404s so understand what is the cause then apply an appropriate solution – 301 redirect or serving well designed 404 page will help you win over Google’s love. https://digitalreadymarketing.com/wp-content/uploads/2014/01/soft-404.jpg 92 320 Tony https://digitalreadymarketing.com/wp-content/uploads/2015/11/drm-paypal1.png Tony2014-01-28 11:37:232015-10-01 10:40:22Soft 404 Errors - Does it hurt your website ranking?